This beautiful bake sees the pears stained with blackberry juice rather than the usual red wine. We’re already at week 6 of GBBO, I feel as though if I blink the show will be over! It was pastry this week with a signature bake of Frangipane Tart, a technical challenge of Flaounas and a showstopper of Vol-au-Vents. During the week I somehow learnt what the challenges were and being in possession of the GBBO Celebrations book I was able to enlighten myself as to what Flaounas were; I’m sorry Paul, they just didn’t draw me in! And given the fact that Mr E didn’t fancy being transported back to the 1970’s with the Vol-au-Vents we rapidly decided to make a beautiful Frangipane Tart, which I was more than happy with as I adore the almond filling. I knew straight away that I wanted to use the classic pear in my tart, and I also knew that I love the aesthetics of the stained pears. Usually, the pears are poached in a red wine to achieve this, but not being much of a drinker this clearly didn’t appeal. So given the humble blackberry is now ripening where were are in Yorkshire, I decided to use a blackberry liquor for the pears to gently poach in, and use some more blackberries through the actual Pear Frangipane Tart. So off I went on Tuesday with boxes in hand to forage for some beautiful, juicy blackberries. I spent about an hour picking the fruits and came away with quite a hoard, even having enough to share with one or two of our neighbours and stock piling some in the freezer. I was so pleased picking all of those fruits, thinking to myself of the small saving we’d made by foraging for our own. However, that pleasure soon disappeared when it became evident on Wednesday evening that I’d been bitten by an insect! I’m not going to even consider which critter took a bite of me whilst I picked the blackberries; I’m not much of an insect lover when they’re creeping near to me – though I do have time for ladybirds. Well, they’re really quite cute with their polka-dot wings, plus they don’t scuttle like some I could name! Anyhow, I am now taking a course of antibiotics as I was bitten above my eyebrow and my forehead and the skin around my eye has swelled up a treat! It’s a good job I’d already decided not to use alcohol in this bake. I shall have to remember to keep covered up next year, or perhaps forage in the supermarket! So, after that detour, on to the Pear and Blackberry Frangipane Tart! I stained the pears by poaching them in a blackberry liquor and once they were tender the blackberries were then cooked down to make a jam which was spread on the base of the pastry case. The pears, unfortunately, were a little too long to lie straight in my flan case, so I gently encouraged them to curve, in the same way as Nadia did with her pears on the GBBO show. I also laid some whole blackberries alongside the pears to give an extra burst of flavour and colour. The aroma throughout the house whilst the pears poached in the blackberry liquor followed by the mixing and baking of the frangipane was beautiful. Who needs air fresheners when baking smells so darn good! I’m really pleased with how well it’s turned out. The blackberries stained the pears beautifully and the inclusion of the blackberry jam and whole berries alongside the pears was delicious providing a wonderful slightly tart contrast to the sweet frangipane. And the pastry, well there’s no soggy bottom here! 1. Start by poaching the pears. Set 12 blackberries aside for the flan. Place the blackberries and lemon zest into a large pan and half fill with water. Add the sugar and place on the hob and bring to the boil to dissolve the sugar. Reduce the heat so that the mixture is not even simmering. Meanwhile, thinly peal the pears. Halve the pears, then remove the core and stalk with a paring knife and tea spoon. Place the pears into the blackberry liquor with the cut side uppermost once the sugar has dissolved. Half cover the pan with a lid and allow to cook for 20 – 30 minutes until the pears are tender when a skewer or cocktail stick is inserted. Carefully remove the pears from the pan, placing them on a large plate to cool. Once the pears have cooled, gently remove any blackberry residue from the fruit. Place on a sheet of absorbent kitchen roll, cover and set aside. 2. Make the blackberry jam. Increase the heat under the blackberry mixture allowing the liquid to reduce in volume. Stir regularly. Add the juice from half of the lemon and stir. Once the blackberry liquid has reduced to a quarter of its original volume, place a spoonful of the mixture onto a chilled tea plate. Place the tea plate in the fridge and remove the blackberry mixture from the heat. After a couple of minutes, remove the blackberry sample from the fridge and test to see if the ‘jam’ is ready. Run your little finger along the plate to touch the mixture, if the mixture crinkles as you touch it the jam is ready. If not, cook the mixture for a little longer and re-test in the same way. Once the mixture is ready, pour into a bowl and set aside. 3. Meanwhile, make the pastry. Place the flour, icing sugar and cubed chilled butter into a good sized bowl. Rub the butter into the flour and icing sugar between your thumb and finger tips, until the mixture resembles breadcrumbs. Make a well in the centre of the breadcrumbs and add the beaten egg. Using a rounded pallet knife, or similar, cut through the mixture to make a dough. You may need to add a little cold water to fully bring the mixture together. Tip the dough onto a lightly floured work surface and lightly knead the dough for 10 seconds. Shape the pastry into a ball and flatten into a disc. Wrap in cling film and place into the fridge for 20 minutes to chill. 4. Line the flan tin. Remove the pastry from the fridge and place onto a lightly floured work surface. Roll the pastry out until it is nice and thin, about 2mm. Wrap the pastry around the rolling pin, lift it up (using the pin) and place into the flan tin. Gently tease the pastry into the case so that it sits into the edges well and picks up the shape of the fluted sides. If the pastry tears, patch it with surplus pastry. If the pastry over hangs the sides of the flan tin excessively, use a pair of clean scissors to trim off some of the excess. Use a fork to gently prick the pastry base. Place into the fridge to chill for about 10 – 15 minutes. 5. Make the frangipane. Put the softened butter and sugars into a bowl and beat, with either an electric hand held beater or wooden spoon, until the mixture is pale and fluffy. Add the almond extract to the lightly beaten eggs and mix. Add the egg to the butter and sugar mixture a third at a time, beating well after each addition. Sieve the ground almonds into the mixture. Fold the almonds in gently using a spatula or large metal spoon. Cover and set aside. 6. Pre-heat the oven to 190c / 170 fan / Gas 5. Place a baking tray onto the middle shelf which is large enough to house the flan tin. 7. Blind bake the pastry. Remove the lined flan tin from the fridge and trim off the excess pastry from the pastry case with a sharp knife. Cut a sheet of grease proof paper large enough to cover the flan tin. Scrunch it up and open it out. Gently lay it on top of the pastry, easing it into the edges. Weigh the paper down with baking beans or uncooked rice. Place into the oven (on the heated baking tray) and cook for 11 minutes. After 11 minutes, remove the baking beans and grease proof paper and cook for a further 7 minutes. Remove from the oven and allow to cool. Keep the baking tray in the oven and leave the oven on at the same heat. 8. Prepare the pears. If your pears are longer than the radius of the flan you will need to curve the pears as you lay them onto the frangipane. If they are not too long, you can lay them in straight, pointing to the centre. For long pears, place the pears cut side down onto the work surface and make 6 deep cuts through the pear. For the shorter pear make the 6 slashes, but cutting only half way through the fruit. 9. Fill the pastry flan. Once the pastry has cooled, place 2 tablespoons of the blackberry jam onto the pastry base. Use the underside of a teaspoon to spread it out. Fill a piping bag (no nozzle required) with the frangipane mixture and pipe over the jam (this will prevent the jam from being disturbed). Use another teaspoon to gently smooth out the frangipane if necessary. Using an off set pallet knife (or spatula) lift a pear and lay it on top of the frangipane, with the rounded end butting to the pastry edge and the pointed end into the centre. If your pears are long, encourage them to create a curve though still pointing to the centre. Place the remaining 3 pears in the same way aiming for an equal distance between each of them. Place 3 blackberries between each pear. Avoid pushing the fruit into the frangipane. 10. Bake the frangipane. Place the flan tin into the oven (on the preheated baking tray) and bake for 35 – 45 minutes. You may need to rotate the tart after 25 minutes of baking. The tart is ready when the sponge is golden brown and a skewer inserted into the centre come out clean. Remove from the oven and set aside to cool. 11. Glaze the fruit. Mix the sugar with the boiling water in a cup. Once the sugar has dissolved, use a pastry brush to glaze the pears. Alternatively you may prefer to use a little watered down sieved apricot jam for this. Enjoy served with some fresh whipped cream and toasted flaked almonds. Beautiful warm or cold. 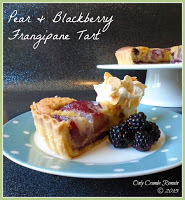 I love frangipane in all its guises and this is just the most fabulous flavour combination. I just so want to go and make it right now. Ooo, that bite sounds painful, has it calmed down now after the antibiotics? I musn't have very tasty blood as I hardly got touched in Scotland whilst everyone was getting devoured by midges. Yes thankfully, it's all calmed down now. I must taste good to insects or something – this is the third time that I've been bitten this season resulting in my skin reacting! Thankfully it didn't itch too much with being around my eye like the other bites did! Ooh that frangipane was delicious Mands, go forage yourself some blackberries, hope you enjoy it as much as we did. I must admit I'm not sold on fresh figs (figs rolls are a different matter) so if you post your fig frangipane I'll certainly have a look with interest. Pears and blackberries? YUM! 🙂 It looks delicious. This is such a gorgeous bake! I admire the extra effort you put into this with the blackberry jam and staining the pears. Brilliant! Aw thank you. We've still got loads of blackberries to pick here and many of the bushes on our walk this weekend were still green so no where near! The peach melba style frangipane sounds delicious – will pop over. oh how fun that you got to pick your own blackberries! they've been gone in the States for ages – I'm so jealous! You've surprised me, I would have imagined the blackberries would have been out at a similar time to ours in the UK, especially the Northern states – I've learnt something new there! It was great picking them, it was a lovely day and so quiet in the Local Nature Reserve where I picked them, apart from a few blackbirds and wrens singing. Ha-ha, I must taste good or something as that was the third time this year of being bitten and my skin reacting to it! I'll have to go out in a bee keepers outfit next time! Thank you Mandy 🙂 I was rally pleased with how well it turned out. Yummy! Sounds like a lovely flavour combination! Thank you Sophie, it's was really delicious, the pears, blackberries and almond worked so well together. Wow- your tart is so deep… and therefore, much more delicious! With the recipe I followed, I only ended up with a small amount of filling, similar to some of the bakers on the show. I would love much more, though! And geez….. your stained pears are gorgeous! Thank you Caroline. They worked really well in the frangipane giving it slightly tart flavour against the sweet pastry and frangipane. 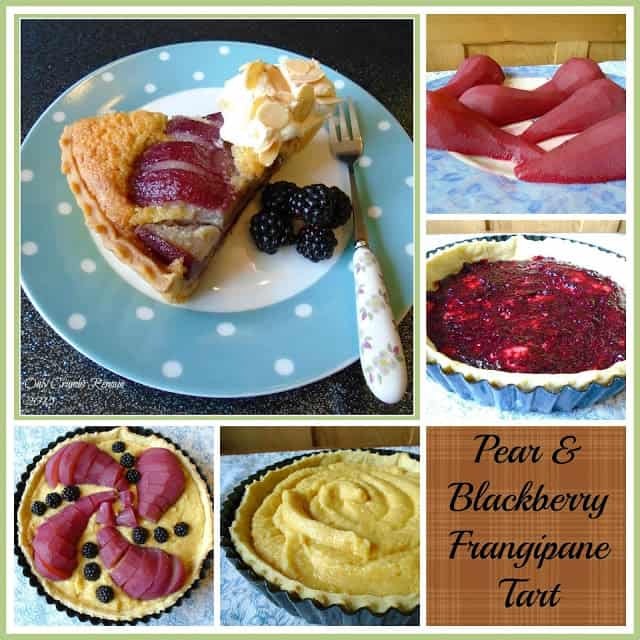 What a lovely looking tart and so Autumnal with your flavours…yum! Mmmm, your tart looks gorgeous, I bet the pears cooked in blackberry tasted divine too! Love the chunks of pear softly curving round, it is so pretty. Thanks for linking up with #PerfectingPatisserie, it is great to have you there! Your welcome Lucy, though thank you for hosting, popping by and commenting. I love, love, love frangipane. Add pears and you have one of the most scrumptious combinations. I imagine blackberries in there, with their tartness, would add an extra yummy dimension. Thanks for sharing! I'm with you there Mel, I too love frangipane! The blackberries were brilliant in it with their tartness – I'll certainly include blackberries in one again. Aw thank you Rebecca. I was more than pleased with the pattern on top, though when I realised the pears were a little too long to lay them flat I felt a little deflated until I remembered what Nadia did on GBBO. Thank you Cathy 🙂 It certainly did taste amazing! Thank you Jasmin, it certainly does look lovely with that curve – it was a bit of a serendipity moment! Though I must say I think to portion it up equally it's easier if they lay straight! Ooh, you must a frangipane tart soon Jasmin! 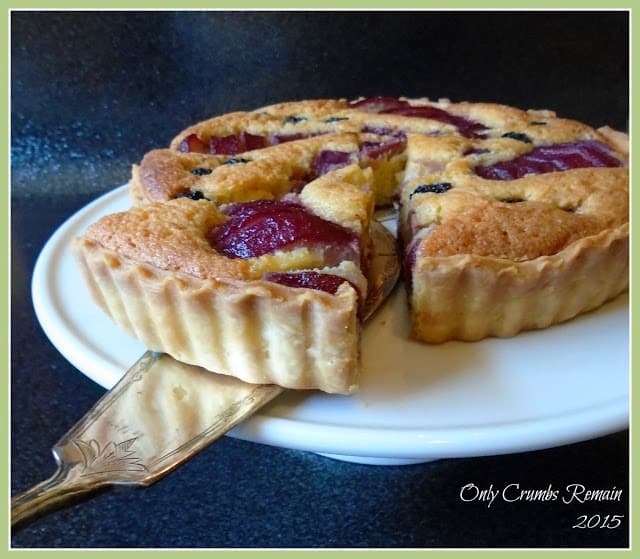 what a gorgeous looking tart – the design with the blackberry stained pears is so clever! i bet that tasted amazing! so sorry you were bitten though – the things we do in the name of baking! Thank you Jenny, it sure did taste good. Even my dad, a typical Yorkshire chap, who usually says things are 'alright' (good praise from him), actually commented I could charge handsomely for a slice of it! As you say, things we do in the name of baking! I'll just have to cover up more next time.